If you have a basic idea how wikiloops collaborations evolve by creating remixes of an initial session template, and by posting such remixes as attachments to the remixed parent track, you will find it easy to "read" the visual representation as presented within the track info panel. Let's begin with the "musicians"-tab, which is the panel opened by default. We can tell there are three musicians involved in the making of our current track right away. These folks did not meet to record this track, but they added to the recording one after another. and the musician who supplied the currently playing remix is the one displayed at the very bottom. and we are now listening to rp3drums' remix of Ernies version, in which Drums were added. These are resembled by the small instruments displayed below the last musician as "available remixes". The musicians tab (see screenshot in previous paragraph) offers different ways to navigate from the current track to other tracks belonging to the same collaboration. There are many situations in which one may want to check out the initial track or an earlier remix step, be it to be able to judge what was added by the last contributor or to return to a stage where ones own instrument was still missing. You may do a quick A / B comparison between the current track and its previous steps with the MUTE button, or navigate to the previous tracks own page with the GOTO button. 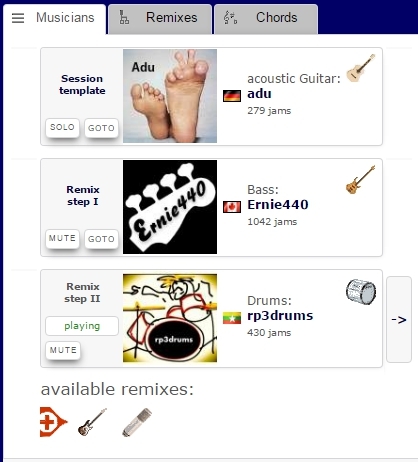 Whenever there are remixes of the current track available, an instrument icon resembling the remix(es) added content shows up at the bottom of the list. It is fun to have a listen in which direction the remixers have taken the track, and you may always return to the current version and do your own remix. 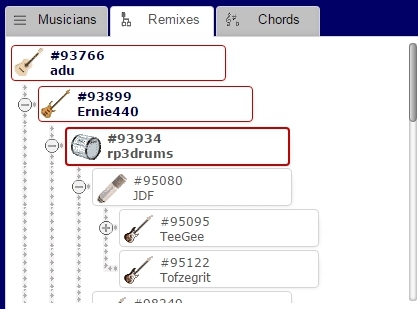 If our example track features Guitar, Bass and Drums and there is a second track in which someone added different Drums to the same guitar + bass track, you can compare the alternative versions with the so called "side-flip" navigation buttons, as shown right of rp3drums listing in the screenshot. All of the navigation options covered here are of course only available if there are remixes present - if you are looking at an unremixed session template, then there is not much to navigate so far. The second option to visualize the inter-linkedness of remixes is the so called "Remix tree" which you may open in the "Remixes"-tab in the Track-Info area. The remix tree displays all tracks which belong to the same session template in the structure of a tree diagram. The session template is displayed at the very top-left corner, with the remix branches "hanging down" to the right. The currently playing track is highlighted with a red border to keep you oriented, and you may navigate to any of the displayed tracks by clicking on them. For an almost frightening demonstration of how large remix trees can grow on wikiloops, have a look at the remix tree rooting in track #816. If you are not familiar with navigating to a track by Track-ID yet, that is explained here.